Our book basket for December has been filled with all sorts of Christmas and winter themed stories. One of them, The Story of the Snow Children by Sibylle von Olfers is filled with wonderful illustrations of a little girl in a red coat, sweet little snow children and a gorgeous frosty landscape. 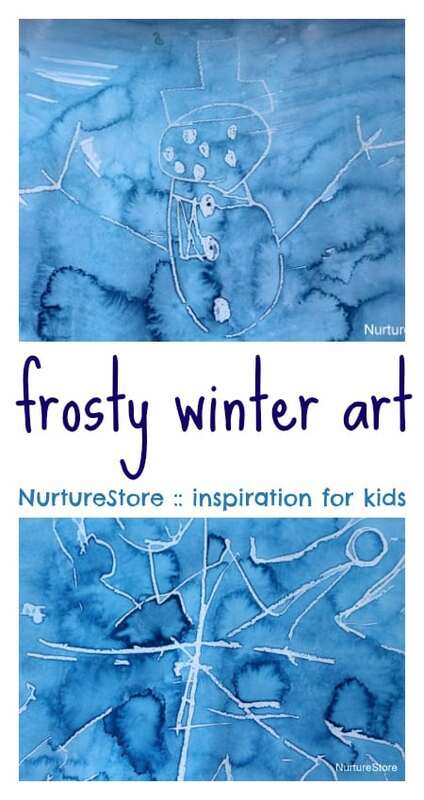 What a great inspiration for trying some frosty pictures of our own! 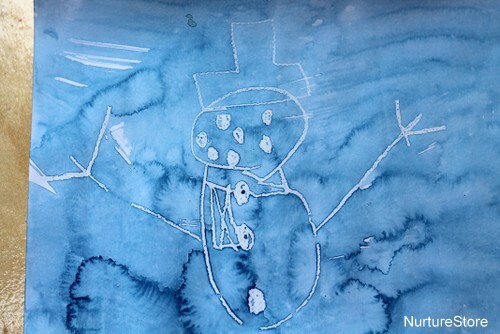 A technique that is perfect for making winter art is the combination of wax crayons and water paint. Have you tried it? You start by drawing out a design using wax crayons. 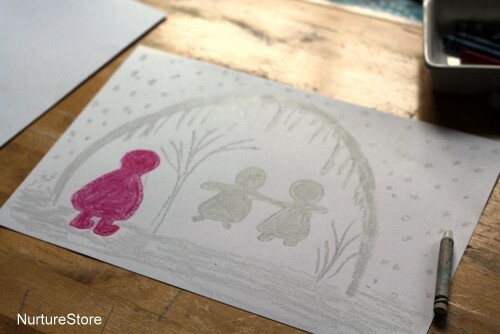 For our winter theme we’re using white wax crayon on white card. Even though they are the same colour, you can see the wax crayon well enough on the card to draw out your pictures – but that’s only the start. Then you need to brush over the whole of your picture with water paint, and the magic happens! 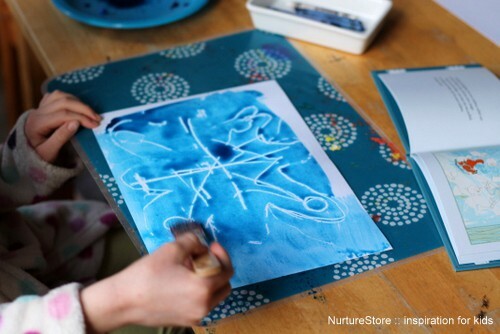 The wax crayon resists the water paint, and your initial drawing appears clearly through the water paint. 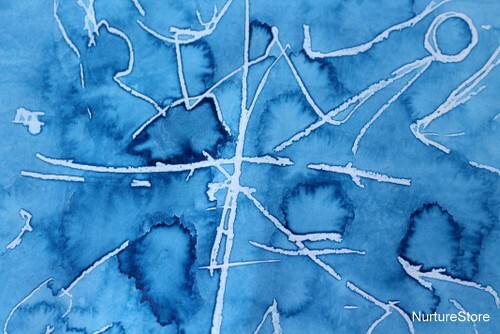 White wax crayon with a wash of blue water paint is a great wintery combination. Here’s my design. 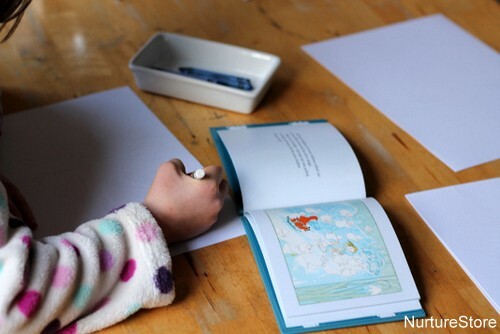 Do you join in when your children are drawing and painting? I love to sit alongside and have a go too. It sends a message to your children that this art thing is important! Plus it’s fun for me to have a try. Why shouldn’t we adults have some creative time too? And have you ever seen a parent who can’t resist joining in / directing / even taking over their child’s art? 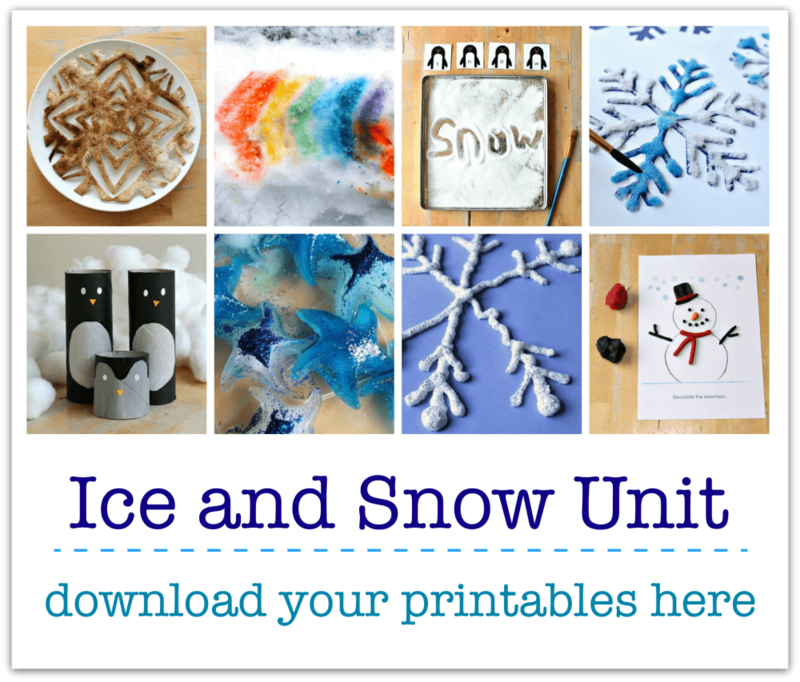 Sitting them alongside with their own paper and paint lets everyone enjoy themselves and make their own creative mark! It’s also a way to perhaps demonstrate a variation that the children haven’t used yet. 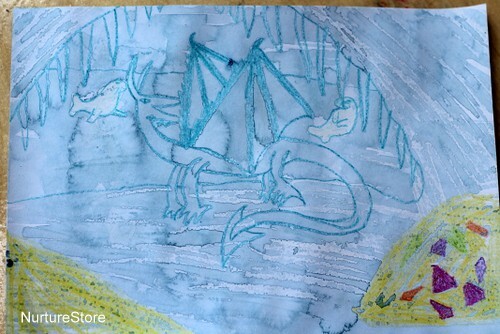 You’ll see I used a red wax crayon too, to match the little girl character in the story – and see how she stands out in the foreground once the water paint is added. or draw your favourite thing of all. In this case, dragons! Lol! I love how you ask if you join your children in arts and crafts! I am such an overbearing orchastrator LOL! I have learned finally, through months of practise and seeing what doesnt work, how to finally set aside my things to do and always having my own activity to create along side! 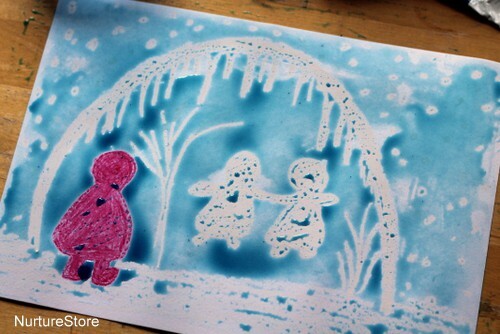 If LO is water painting, i am printing TWO pics to paint … Lol If I dont she instructs me to and so there! I Have to partake, i wouldnt have it any other way now 😉 This is fantastic! Great drawing! I am no skilled artist and do alot of free printables for our paint/coloring projects LOL I am sure LO will be teaching me to draw next! (Ps i still havent found an email with the book;() Thank you for the idea!! Oh no – I wonder why you can’t find your e-mail? It will have been sent to the e-mail address that is associated with your PayPal account. If you need me to send another link to a different e-mail address, do let me know. In fact, I’m, going to grab the e-mail address you’ve left here and send you another copy over. Please let me know if it doesn’t arrive. Beautiful!!! What kind of paper did you use? Thanks Emily. On this occasion we used some plain and simple white card – nothing fancy, and not special water colour paper.